Accentuating the mountains, the sunset creates what appears to be an ancient pyramid in the distance. 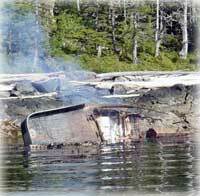 Ketchikan: Coast Guard responding to grounding, vessel fire near Ketchikan –The Coast Guard continues its response today to Sunday's grounding and fire aboard the 58-foot fishing vessel Legend at Bostwick Point about eight miles south of Ketchikan. The burned out hull of the 58-foot fishing vessel Legend sits grounded at Bostwick Point eight miles south of Ketchikan July 11, 2011. The vessel grounded Sunday and subsequently caught fire. U.S. Coast Guard photo by Marine Safety Detachment Ketchikan. A Coast Guard Station Ketchikan small boat crew with Marine Safety Detachment Ketchikan pollution investigators aboard assessed the Legend Monday morning and reported the approximately 700 gallons of diesel and a catch of 2,000 pounds of salmon aboard were consumed by the fire. Minor sheening has been reported by the response boat crew. Southeast Alaska: New Timber Task Force Appointments Announced - Alaska Governor Sean Parnell announced Friday nine appointments to the Alaska Timber Jobs Task Force, which was recently created by Executive Order 258 to focus on and prepare recommendations for timber industry job creation in Alaska. The nine members are: Owen Graham, Elaine Price, Bryce Dahlstrom, Randy Ruaro, Chris Maisch, Kyle Moselle, Susan Bell, Brad Cox, and Beth Pendleton. Owen Graham, of Ketchikan, is the executive director of the Alaska Forest Association, a position he’s held since 2001. Prior to his work with the association, Graham managed the timber division of the Ketchikan Pulp Company, where he also worked as the chief logging engineer and contract manager. For the five years prior to joining the pulp company, Graham was a logging and construction engineer with the Crown Zellerbach Corporation. He received his bachelor’s degree in forest management from the University of Washington, and is appointed as a representative of the Alaska forest products industry. Elaine Price is the projects manager for the City of Coffman Cove. She is the former owner of several small businesses, including Southeast Excavation and Landscaping, Safety First, and Shady Grove Nursery. An active member of her community and region, Price is also a member of the Southeast Island School Board, the Blue Water Christian Camp Board of Directors, the Alaska Island Community Services Board of Directors, the Prince of Wales Advisory Council, and she is the current chair of SEAtrails. She has been involved in local government for some time, including former service as the mayor of the City of Coffman Cove, and current service on the city council. Price is appointed to a seat representing Southeast Alaska communities. Fish Factor: Annual Report Provides Average Wholesale Prices for Salmon By LAINE WELCH - The first wholesale price for salmon gives the best indicator of how well it should sell in world markets. And prices in 2011 show nice increases so far, nearly across the board. In its Annual Salmon Price Report (ASPR) the state Revenue Department/Tax Division provides average wholesale prices for salmon as it sells throughout the year. The report is broken down by Alaska region and covers six product forms: canned, fresh/frozen whole, fresh/frozen fillets and roe. The reports are compiled from prices submitted by processors that sold at least one million pounds at wholesale. The ASPR covering sales from January through April show that prices were up substantially in almost every salmon category. By far, most of Alaska’s salmon pack goes out as H&G frozen, and Chinook averaged $4.12/lb, compared to $3.31 last year. Frozen sockeye averaged $3, an increase of 17 cents per pound. For chums, an average of $1.78 is an increase of 41 cents. No frozen pink sales were listed through April; in 2010 the pink average was 91 cents a pound. The only decrease in frozen H&G salmon was coho salmon, which averaged $2.37, down from $2.49 during the same time in 2010. Frozen salmon fillets also showed nice price increases through April, with Chinook fillets fetching $8.75 a pound, up from $2.40. Sockeye fillets wholesaled at $6.29, compared to $5.18. Cohos averaged $5.13 a pound, up from $4.61; Pink fillets were at $2.69 a pound, and frozen chum fillets averaged $3.34, an increase of 91 cents from the same time last year. Ketchikan: Alaskan & Proud Joins Unified Grocers - Unified Grocers, the largest wholesale grocery distributor in the western United States, today announced that Williams Incorporated, which operates four retail grocery stores under the Alaskan & Proud banner in southeastern Alaska, has become a member of Unified Grocers and will begin receiving groceries and other supplies from Unified on August 1, 2011. Alaskan & Proud had previously been supplied by Supervalu for more than twenty years. Alaskan & Proud operates two full-service, conventional supermarkets in Ketchikan and Juneau, AK; a community grocery store in Thorne Bay, AK and a convenience store, also in Ketchikan. The four stores range in size from 7,000 sq. ft. to 43,000 sq. ft. and employ approximately 220 associates in the communities in which they operate. Southeast Alaska: Huna Totem Corp. partners with Glacier Bay Lodge on cultural programs - Huna Totem Corp.’s Cultural Interpretive Services department launched a series of Tlingit performances and cultural presentations at the Glacier Bay Lodge last month, in partnership with the lodge and the National Park Service. Tlingit interpreters Alice Haldane and Bertha Franulovich share traditional stories and songs in a program called “Tlingit Fireside Stories” in the Glacier Bay Lodge lobby. They also display and discuss traditional art, tools and regalia and lead an informal discussion. The presentation takes place on alternate Saturdays through the summer (July 23, August 13 and August 27). 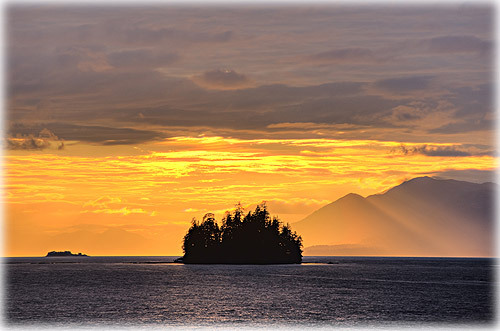 A more formal program called “A Waterway of Life” introduces guests to the Tlingit people and their connection to Sit’ Eeti Gheeyi, the Tlingit name for Glacier Bay. Led by a Tlingit interpreter, the presentation is held in the Glacier Bay Lodge theater on alternate Mondays (July 11, July 25, August 15 and August 29). The Glacier Bay Lodge offers the only accommodations in Glacier Bay National Park and Preserve, and is located near Gustavus.